Participants listen to speakers during the kickoff rally across the street from Planned Parenthood. 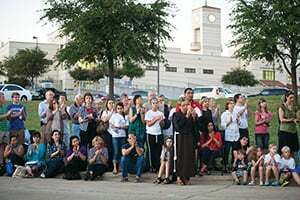 More than 300 participants of different faith backgrounds showed up to help kickoff the 2013 40 Days for Life prayer campaign Sept. 25. Crowds of participants peacefully lined the sidewalk across from the new Planned Parenthood building in southwest Fort Worth. It was at here, with a clear view of Planned Parenthood as the backdrop, that organizers of 40 Days for Life kicked off their local pro-life rally Sept. 25. Fort Worth is one of 306 cities participating around the world. This includes 273 locations in the U.S. and 33 cities in nine other nations. Tens of thousands of volunteers have made commitments to the 40 Days for Life mission to end abortion through a 24 hour per day vigil of prayer, fasting, and peaceful activism. The lengthy campaign continues through Nov. 3. Dr. Marcellino D'Ambrosio, a prominent Catholic commentator and author, talks to participants at the rally. 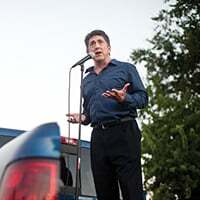 With the comfort of knowing there were friends in the neighborhood, 40 Days for Life organizers continued the rally with keynote speaker Marcellino D’Ambrosio, who holds a Ph.D. in theology and in biblical interpretation. He directs the Crossroads Initiative, an international apostolate of evangelization and renewal, is a New York Times best-selling author, and has appeared on national television news shows. For the Fort Worth audience, D’Ambrosio quoted Saint Paul: “Rejoice in the Lord always. I shall say it again: rejoice!” (Philippians 4:4). “There is cause for rejoicing right here,” D’Ambrosio said, looking toward the new $6.5 million Planned Parenthood building. He explained that in 2004, 40 Days for Life started in front of a Planned Parenthood center in Bryan/College Station and continued there for three years before it expanded globally. Last month, he explained, the Planned Parenthood facility in Bryan/College Station closed. If it could happen there, it could happen here, he explained. 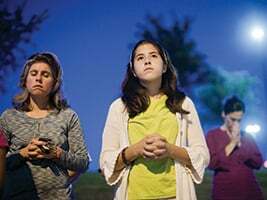 Gustavo Rodriguez and his wife, Nancy, lead their children, Samantha (left), Sarah (center), and Susana (right) in praying the Rosary outside Planned Parenthoood after the kick off rally. The family is from St. Elizabeth Ann Seton Parish in Keller. Emcee Steve Karlen, who serves as the director of North American outreach for 40 Days for Life, echoed D’Ambrosio’s comments. He encouraged volunteers to remain strong and steadfast over the next 40 days. “Don’t despair,” Karlen said. “We have our Lord and Savior Jesus Christ who knows what it’s like to walk in our shoes. He ministered in a world similar to ours. Gabriella De La Torre, 11, prays with hundreds of other participants during the closing prayer of the kickoff rally. Karlen concluded with a challenge for volunteers. Pointing to the Planned Parenthood building, he said, “They have built a fortress here. How else can I describe that, except as an abortion fortress? They are counting on us getting tired and going away,” he said. “I know that you won’t let them outlast you, because you understand the stakes,” Karlen told the crowd. “You know this is a matter of life and death. I know that they won’t outlast you because you will fight the good fight. You will finish the race. You will keep the faith, because you — the body of Christ, his hands and his feet — will come here to bring the light of Christ to this place that is so desperately in need of it. 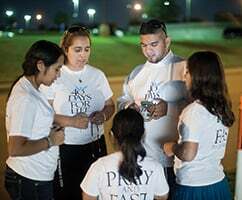 The campaign is still needing individuals to sign up to pray during the overnight hours, and people are welcome to pray at any time, even if they are not signed up. For more information, or to sign up for a specific hour, visit http://www.40daysfortworth.com/.